Here is our portrait of the Chaos Gods. In the game, this will be the image on their faction sheet. The Chaos faction actually has three greater gods. Most factions only have one, though there are two other exceptions - the Invisible God faction has none, and the Earth faction has two, but they're identical in game terms. I suppose the Invisible God worshipers would argue that their god IS there, he's just invisible, intangible, and his effects so universal as to go unnoticed by the primitive screwheads that make up the other factions. So is it left to right? I must say I really like the Ragnaglar art (even better than the sculpt prototypes posted elsewhere) It looks more spindly and chaotic. Pretty sure I know which faction everyone will want to use... kickass stuff! I love the greater god asymmetry between factions. I will say that Chaos is great fun to play, and its awful abilities make the other players complain - music to my ears when I'm Chaos. 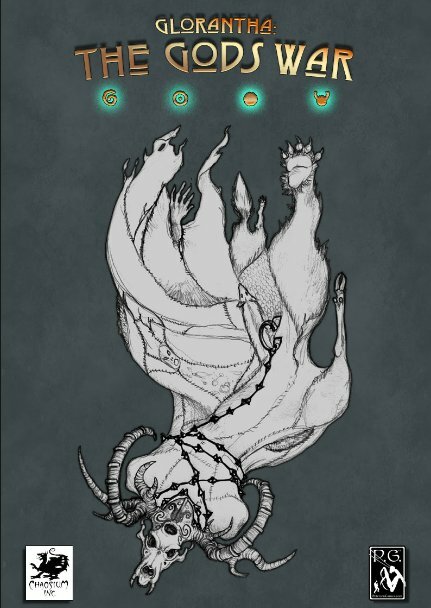 The names of the six Chaos Gifts are: Catastrophe, Oblivion, Blood Sacrifice (does not work like Black Goat's spellbook of the same name), I Fought We Won (gives all players a chance to bravely stand against Chaos or cravenly falter), the Unholy Trio, and Imbed. So just what is going on with the Ragnaglar sculpt? Is his body a giant rug of animal limbs? why is it thrown up in the air? is it a cape? Does it float behind him billowing in the air -- or does he fly and is coming in to land. I like it but can't figure it out. I fear madness may result. I definitely read the figure as "coming into land", or possibly "strafing run", but that may just be me. Mythically, he's a fallen Storm god, so flying is kinda relevant. 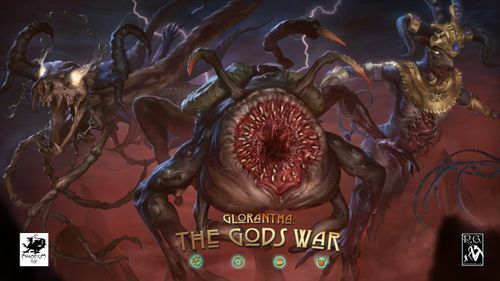 I participated in a game of God's War last year at Gencon, and although I'm sure the game has changed a bit I'm confident that it will still have the same feel, and let me assure you all that if you play Chaos, the rest of the table will HATE you. Sandy's right, Chaos is a fun faction to play (and effective!) but expect a lot of grief to come your way. And if they are smart, that grief comes early. Chaos is hard to root out if they give you too much time. I have to concur with being confused by the Mad God sculpt. But I don't like it, I hate it. The idea was to make it as big as Cthulhu? Okay. But why was all the plastic wasted on a flat depiction of a fur cape angled up unrealistically?? Really, all that extravagant plastic and size, for a flatly-oriented fur cape? I'd rather that plastic be saved to make 2 Titan brothers instead of 1. 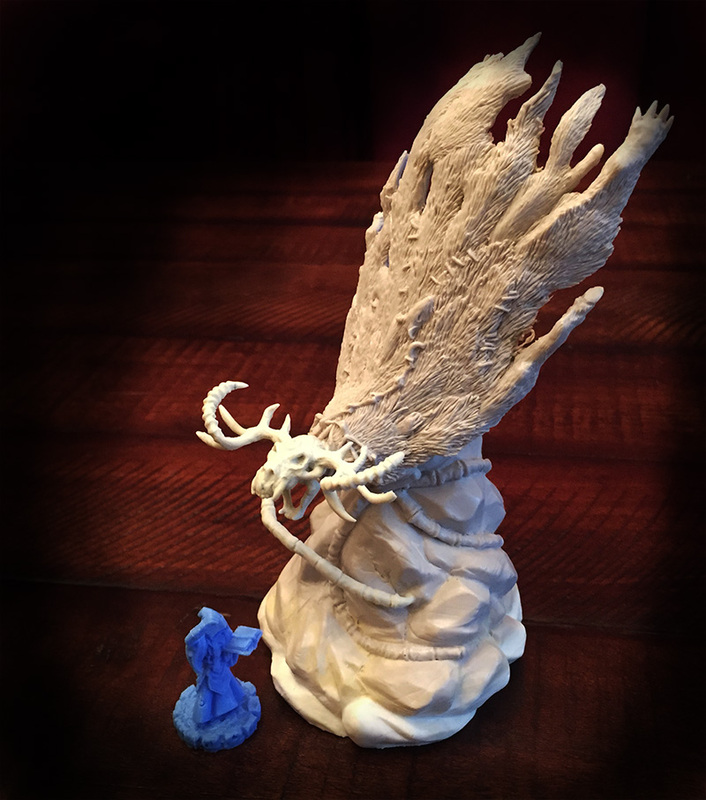 Dice Tower has commented on the "opulence" of Cthulhu Wars minis. Whether or not I agree that the opulence is necessary, it does make the minis very important, and either a deal-maker or breaker for a buyer. Well, a greater god should be a bigger mini that a mere mortal or a lesser god. I still would like to see what's under that cloak. I.e. the backside of the mad god. You really don't want to see the backside of Ragnaglar!